Known as a trailblazer and pioneer for women in combat sports, Ana held multiple title belts in boxing, rising to become a true inspiration to the Filipino community all over the globe. Julaton continues to give back to local communities in the Bay Area and has assisted in typhoon relief efforts, all while training and fighting both in the ring and the cage. Outside the ring, Ana is regarded as a Boxing historian and has done work with national and international TV as a combat sports analyst and reported on the sidelines with some of the biggest names in the sport. With her unique experience as a world class competitor and martial artist, Ana spends time teaching the fundamentals of boxing and self-defense with individuals and groups of all ages and shares her stories about leadership, self-awareness, and striving to be the best version of yourself everyday. Ana dedicated her athletic career by simply working with the gifts she is given and found success in a male-dominated industry. She stands her ground as a fitting and outstanding representative of not only women around the world, but for all people who fight against the grain to achieve success and happiness. ABC, CBS, FOX, NBC, ESPN, Yahoo Sports, Sports Illustrated, Bleacher Report, The Oprah Magazine, ESPN the Magazine, SiriusXM Radio, SF Weekly, and her own Allen & Ginter’s Topps trading card. Showcased at the Golden State Warriors, Oakland Raiders, San Francisco Giants, and Los Angeles Dodgers games. 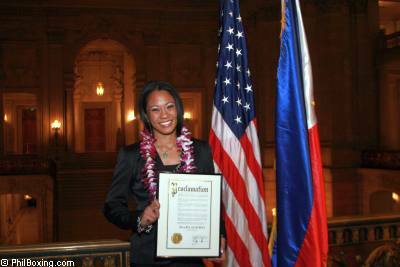 Honored at the New York Philippines Independence Day Parade & the San Francisco Pistahan: Filipino Cultural Festival & Parade. Promoted by Allan Tremblay of Orion Sports Management & competed under Top Rank, Golden Boy Promotions, Bellator MMA & ONE Championships. Ana’s fights was shown on FOX sports, the Paramount Network, & Spike TV. Internationally, Ana’s fights were featured across the globe: TSN Canada, FOX Philippines, GMA Pinoy TV, ABS-CBN, TV 5, & TyC Sports Argentina. Ana fought all over the world: USA, Mexico, Canada, Dubai, Manila, & Argentina, including sellouts of 20,000 in attendance and in front of 40,000 fans during a main event title defense. Ana’s World Championship victory in Canada was the 1st ever women’s boxing match featured live on TSN television shown coast to coast in the country. 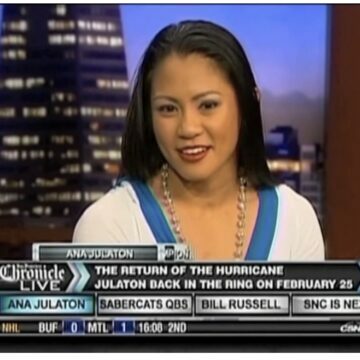 According to Nielson ratings, Julaton’s World Championship win in Canada was the highest for sports amongst global Philippines TV networks that weekend.